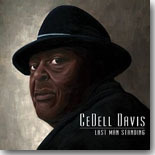 Delta bluesman CeDell Davis is 88 years old, but age refuses to slow him down. Heck, after contracting polio at the age of ten, nearly being trampled in a club stampede in 1957, and suffering a mild stroke ten years ago, age ain’t nothing but a number. After toiling away in relative obscurity for four decades, Davis was able to finally record in the early ’90s, and blues fans were amazed and fascinated by Davis’ slide guitar skills (he learned to play guitar using a butter knife on the frets to compensate for his polio-stricken hands), and his downhome vocals. Though he doesn’t play guitar since his stroke, that wonderful voice is still intact, and recently Davis ventured back into the studio in Water Valley, Mississippi at Bruce Watson’s Dial Back Sound, where Davis’ career was rejuvenated over 20 years ago. Joined by producer/lead guitarist Jimbo Mathus, drummer Barrett Martin, Stu Cole on bass, and guitarists Greg and Zakk Binns, Davis has blessed blues fans with Last Man Standing (Sunyata Records), a stunning, loose-limbed recording that will put you as close to a Delta juke joint as possible without actually crossing the threshold. The set list consists of a mix of classic tunes (“Teenie Weenie Bit,” “Who’s Lovin’ You Tonight,” “Further On Up The Road,” etc…) with both rural and urban roots and several originals. Though Davis was unable to play guitar on these sessions, his voice is still in good shape, roughened up a bit by age which is not necessarily a bad thing for a bluesman. As mentioned above, this is a really loose and informal set and the backing band does a good job backing Davis. Mathus’ production, largely live in-studio, really captures the feel of a juke joint gig and the participants seem to be having a ball not only playing behind Davis, but taking in his stories and performances as well. This set also includes a second disc, Davis’ 2002 live effort When Lightnin’ Struck The Pine, previously reviewed here by Bill Mitchell in September of 2002. On this release, which also includes R.E.M.’s Peter Buck and Brave Combo’s Jeffrey Barnes in support, new listeners will get to experience Davis’ own unique and raw slide guitar playing. Amazingly, a dozen years later, CeDell Davis is still capable of getting it done, despite his numerous setbacks.